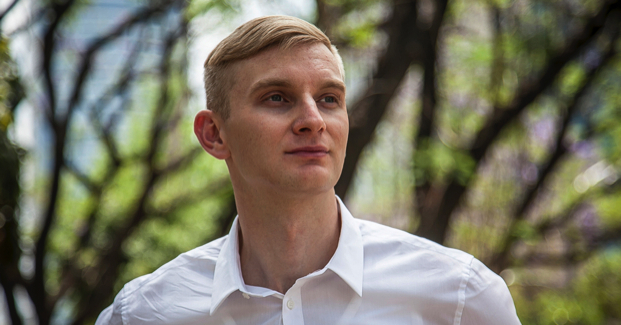 Aleksander Tokarz considers himself a citizen of the world. Since age 8, he flew back-and-forth between Poland and the United States. After graduating from college in 2008, Alex took prominent architectural jobs in Germany, Denmark, and Argentina. But his travels jeopardized his citizenship status in the U.S.. So until that clears-up, he is working in Mexico City, which is quite a contrast for this tall-and-pale Polish immigrant. What were your first impressions of Mexico City ? It was a chaotic scene, with tons of traffic, mobs of people on the streets, and taco stands everywhere. Walking down the street everyone was always looking at me, sometimes stopping me to take pictures with them. It felt like a whole other world. I was fortunate to land a place to live in a decent neighborhood, which at night had its share of vibrant characters. It was a clean slate for me, and I was ready to take whatever the city had to offer. For starters the quality of life is much better in Mexico City. Rent and food are really cheap, and so is public transportation. There is a certain feeling in the air that can’t be explained, but I think it has to do with the pre-Hispanic culture that was here 500 years ago. The rain sometimes can be very heavy, flooding the whole city in a matter of minutes. There is also a volcano nearby that has small eruptions on a weekly basis. The people are very open and welcoming, if you have good intentions. I have a much easier time introducing myself to various circles here without having to worry about if I fit in. Sometimes on Sunday afternoons I go out and do street art without worrying about being harassed by the police. It’s definitely a much more relaxed and chill vibe than New York. I also began to volunteer at a local community center where I was quickly accepted and allowed to do various art and design projects. 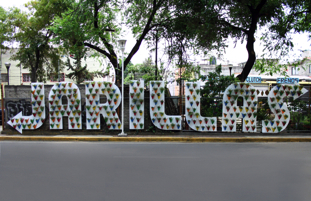 Casa de Cultura las Jarillas is a community center in Iztacalco, Mexico City that promotes cultural proliferation through workshops, theater, arts, and urban farming. They needed a sign as a more visible presence to help steer people towards the community center. It had to be easy to install, preferably integrated with local plants, and had to be seen from across the street where a bus station is located. Each letter integrates special slits with planters. The community center now attracts more people to the area and inspires them to learn about urban agriculture in the city. What are some of the things that are different in Mexico than in the United States ? The art and design of Aleksander Tokarz can be found on archiguru.org. Street exhibition with pictures taken of art in local museums, printed out, and pasted all over the city. Representing Mexico City for the Outings Project. in level one, jumping over obstacles, until you have to come across “The Boss.” Luckily for me being a foreigner played in my favor, even though I didn’t speak the language. To be perfectly honest, when you are white in Mexico and walking around dressed in a suit, no one is going to stop you and challenge what you are doing there. Did you have a plan in mind on how you were going to survive in this new environment ? It can be super friendly, but awkward at times. That’s an example of outsider advantage ? has an eagle landing on a cactus. It’s going to be completed in 2020 and is aiming to be the most sustainable airport in the world and the first with the LEED certification. The airport is a collaboration project with Foster+Partners from England, and ARUP from New York City. But now you have settled into a life and career there ? 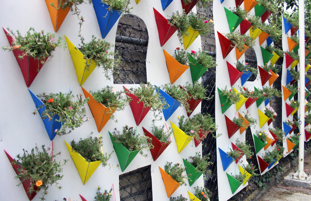 An outdoor vertical garden sign for a community center in Iztacalco, Mexico City. Aleksander Tokarz is also the Creative Director of Scraper magazine.